This weekend a group of person release the first beta version of the WP7Contrib component. This component provide some helper which help simplify WP7 development. They also included some UI controls. This component is build to work seamlessly with MVVMLight. They integrated some other framework like JSON.NET, Silverlight Serializer and Reactive Extensions for .NET (Rx). Last week finalized the implementation for the support of Visual Basic for the Windows Phone Developer Tools. So now any developer with Visual Basic background can now build Windows Phone application (and Game based on Silverlight). For more information, you can read the official post on the Windows Phone Developer Blog here. Have a good time developing Windows Phone 7 application! Yesterday i did a presentation on Windows Phone 7. 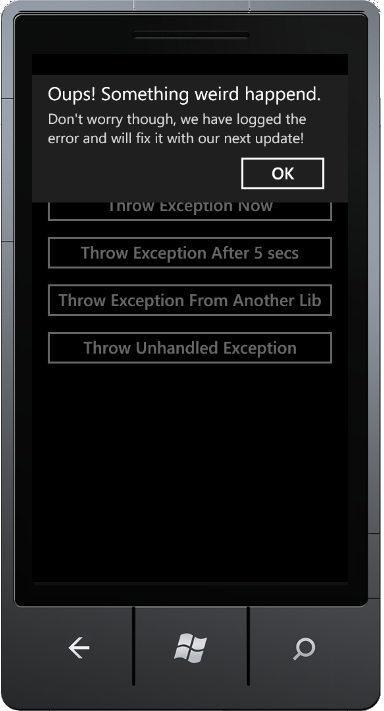 I covered the end to end process of development of a Windows Phone 7 application. I’m happy to see the interest that the crowd showed about the subject. In my presentation I've talk about many feature, tools and component that are very useful. This is a small list, but this will give you a good start. Thanks to everyone who attend at my session last night, i had a great time presenting. Recently i was publishing an updated version of an application on the Marketplace for Windows Phone 7, and my update failed the testing process. message that is displayed is not a user friendly message. 1. Turn on location service on device. 3. Swipe to the map page and select view map. 4. When map is loaded press the Start button on the device. 5. Go to the settings of the device and turn off location service. 6. Press the Back button from the Start screen of the device to reactivate the application. 7. Notice a non-user friendly error notification appears. In reality the problem is not related with the location services. Because i don’t use the location service (i only use the Bing Map for display only). In fact, the real problem it’s that i forgot to handle the Deactivated event and the Activated event. Why do we have to handle the Activated and Deactivated event? Windows Phone 7 doesn’t support multiple application running at the same time (except for some application approve by Microsoft). But when your application is running, for different reason (incoming phone call, the user click the start button, …) the application can be suspended. To eliminate some issues you should handle those event and make sure you persist important information. 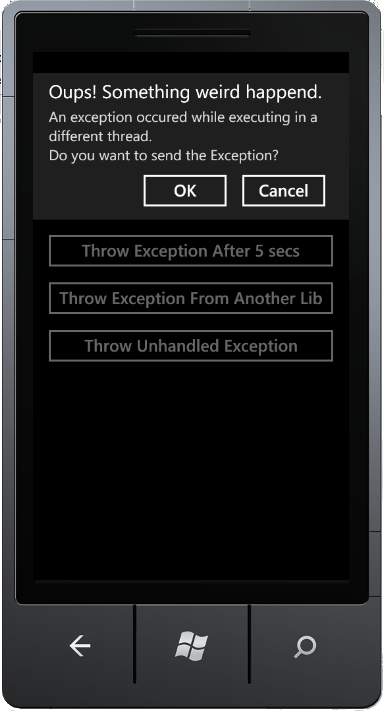 One of the best place to handle these events is in the App.xaml. To do so you need to declare the events in the xaml code. In the Activated event, you can store some data in the the Microsoft.Phone.Shell.PhoneApplicationService.Current.State dictionary. And in the Deactivated event, we can retrieve that information. Make sure to test any scenario that a user may face. Currently, the testing process that Microsoft implemented is pretty exhaustive (which is good because it help ensure that the application in the Marketplace won’t crash). Kevin Marshal of Clarity Consulting post a nice blog about the Quick Jump Grid. The Quick Jump Grid is a model propose in the design template by Microsoft but not available as built-in control at this time. So if you want to implement that kind of feature i suggest that you read the blog and test the demo. Last week Microsoft released the RTM version of the Developer Tools for Windows Phone 7. This weekend i took some times to migrate the application that I’m creating for the TechDays . The migration took me about less than 30 minutes. I only had to fix one issue, which is related to the RTM version. The WMManifest.xml have changed since the Beta version. To fixe the issue i had to create a new Windows Phone 7 project and copy the WMManifest.xml file in my application. And the application was building again. After what i have to change the control type. That was simple as that. The Panorama and Pivot control are working perfectly and smooth. And much better than the other version. Also they provide natively a Map control, which is a Windows Phone version of the Bing Map for Silverlight. I was waiting for that specific control for a long time. I only had to do a drag and drop and assign the CredentialProvider properties and the control was working. Also the team who was working on the Silverlight Toolkit have created a version of the toolkit for Windows Phone. So i was able to use the WrapPanel from the Toolkit instead of importing some code file from the original Silverlight Toolkit. For the emulator, it have been improved again. The start time have been improved. In conclusion, i think as a developer we have all the tools we need to be able to build great Windows Phone 7 application.